A little make for a little person to show you today. Were you here when my darling niece was born? If you were, you might remember I made her into a Blueberry Baby and a Pumpkin Baby? 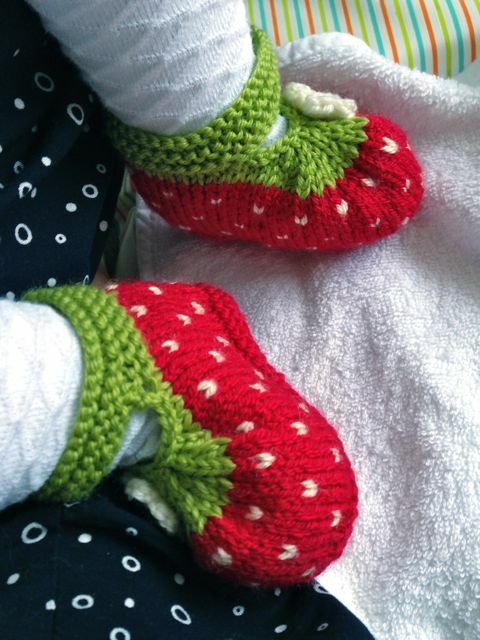 That is to say, I made her a hat and booties set in each of those fruity styles. Well, if you do remember, you'll know that I made those before she was born and before I knew she was going to be an adorable bouncy baby girl. Now that I know that she is indeed an ABBG, me and her Mother decided to break out the Strawberry Baby! Probably the cutest possible type of fruit that a baby could be. I used this adorable pattern for the hat, the same as I used for the blueberry, but in a larger size because these children tend to grow at an incredible rate of knots. And likewise, a larger size of booties, using this pattern, as written this time, that seems utterly ridiculously sized for a 3-6 month old baby, but astonishingly, turned out to fit just perfectly. In fact, the child is not even at the three month stage yet, so perhaps she is just particularly well endowed in the foot region! I'm glad to report that Mummy was as wowed with the fit and the cuteness factor as I was and little bubs didn't burst into tears when we suited her up, which I took to be a big thumbs up because you know how picky these babies can be when the mood takes them! Oh my gosh! The cuteness is killing me... such a lucky little lady! Soo, sooo sweet! What a lucky baby girl. Oooh how sweet are they!! these are the most darling! Soooo cute! I love these! I was going to knit a plan lilac bobble hat for my 3month old baby - but forget that, if it's ok with you I will do these for her instead? This is the prettiest hat and cutest booties I've ever seen for a bouncing baby girl! What a wonderful job you've done on them! hi, these are soo adorable. 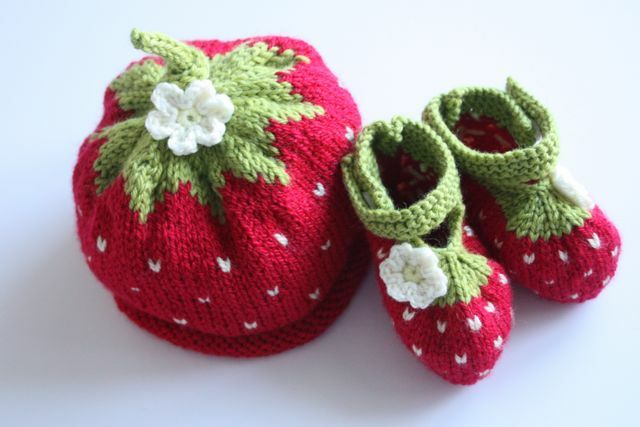 im not much a of a knitter or a crochet-er, but ive been looking for a strawberry hat and matching booties. 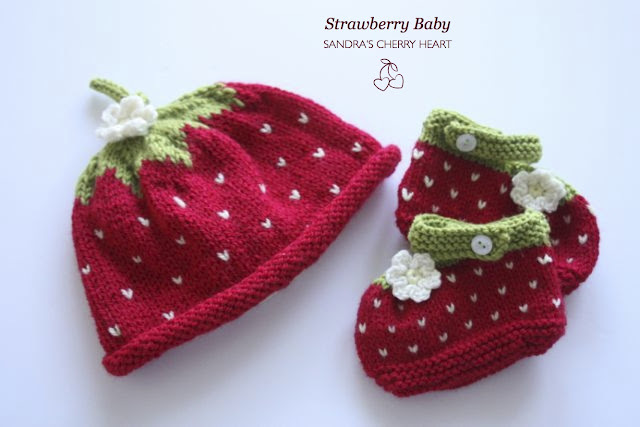 im not sure if you make them to buy, but i would love to buy this strawberry hat and booties. post back on here if your interested in making it for me. Thanks so much for your lovely comment. I'm afraid I don't sell my work, other than patterns, at the moment. Sorry! hiya, my mum makes these if you'd like a set? Hello, and thank you for the lovely berry hat pattern. 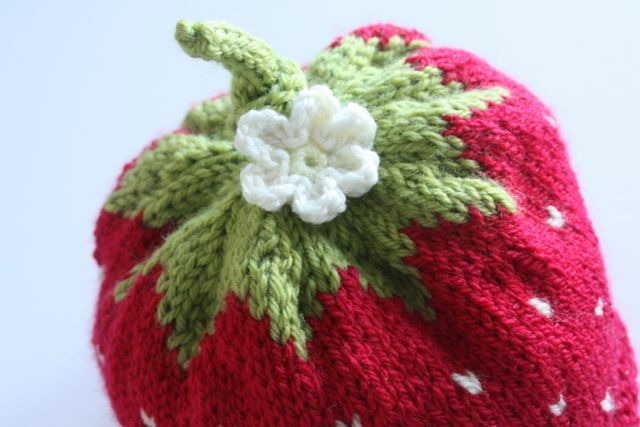 Do you have any guidance on the strawberry, that is, how to knit the seeds into the pattern? I looked in the pattern on ravelry and didn't see it Thank you .